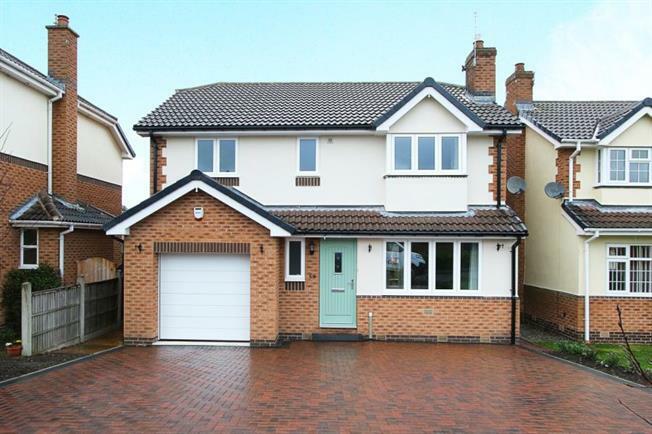 4 Bedroom Detached House For Sale in Chesterfield for Guide Price £340,000. An Excellent opportunity to acquire this beautifully presented FOUR BEDROOM DETACHED family home in the highly sought after area of Walton and offered with NO ONWARD CHAIN. The property comprises of entrance door leading into the hallway which in turn leads into the modern fitted kitchen. The hallway also provides access to the open plan living/dining room with feature fireplace and access onto the rear garden. Stairs lead to the first floor and the FOUR bedrooms and family bathroom with w.c, wash hand basin and bath with shower above. To the front of the property there is off street parking and garage providing ample parking. To the rear of the property the garden is lawned with paved seating area. Walton is a popular location with an excellent range of local amenities close by including renowned schooling, supermarkets, Walton Dam and Chatsworth Road with its cosmopolitan array of shops and restaurants. Chesterfield, Matlock, Sheffield and the M1 are all easily accessible for daily commuting. Areas of Walton also fall into school catchments for the sought after Westfield Infants, Walton Holymoorside and Brookfield Comprehensive.